‘From Peak to Peak’ is the inspiring true story of the first human-powered journey from the summit of Mt Ruapehu (2797m) in New Zealand to the summit of Aoraki/Mt Cook (3750m). In early 2013, Kiwi mountaineer Grant ‘Axe’ Rawlinson came up with the idea of making this unique journey. From the ‘Peak’ of the North Island to the ‘Peak’ of the South Island. However he faced some challenges. He had limited time, limited money and limited equipment. What he did have in abundance was motivation. 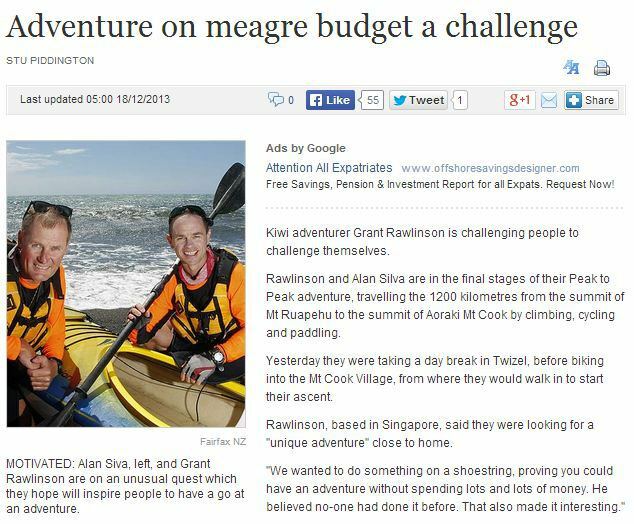 So in December 2013 together with climbing partner Alan Silva, without support craft or vehicles, within the limits of their annual leave, on a tiny budget, with borrowed bicycles, climbing gear and an inflatable kayak they set-off. Their chances of success were incredibly small. 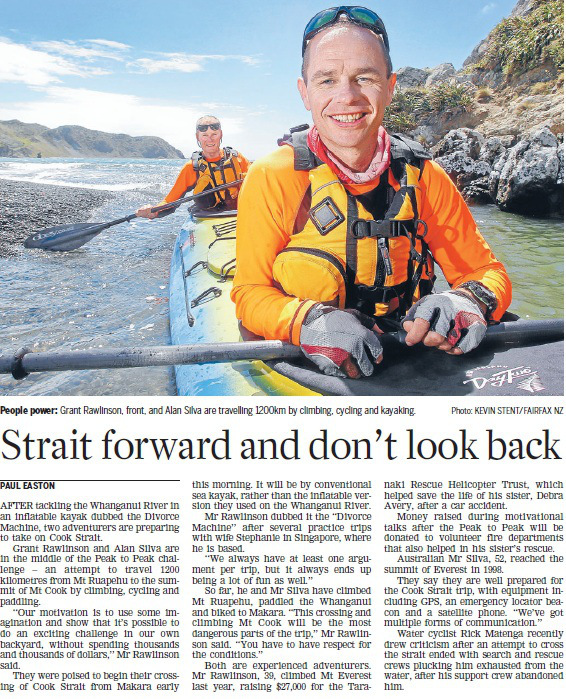 Together they climbed, cycled and paddled their way through and over and up some of New Zealand’s toughest and most rugged terrain. 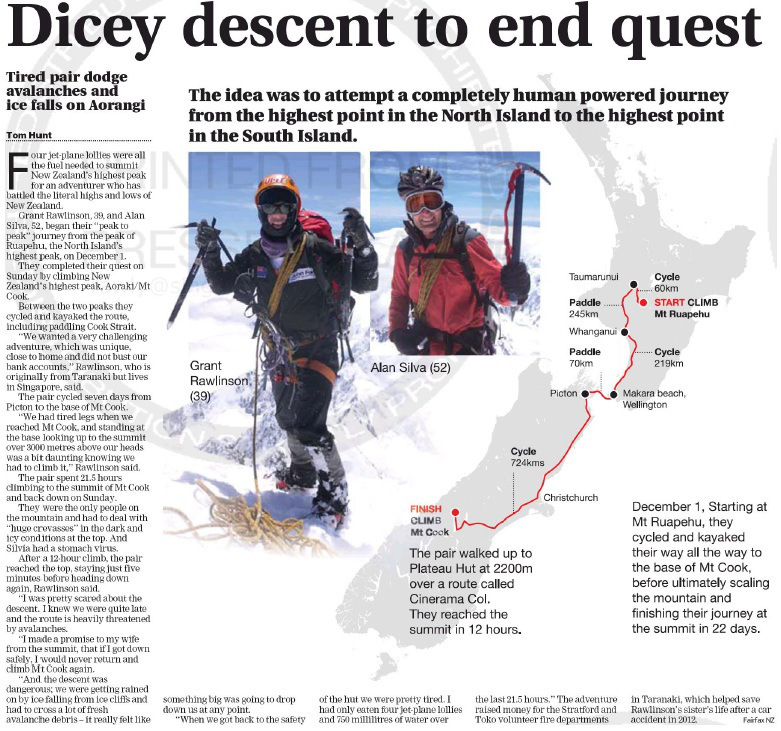 Until on December 22nd, 2013 they stood on the summit of Aoraki/Mt Cook, 22 days and 3 hours after leaving the summit of Mt Ruapehu. The entire 1400km journey between undertaken using solely their own human power. 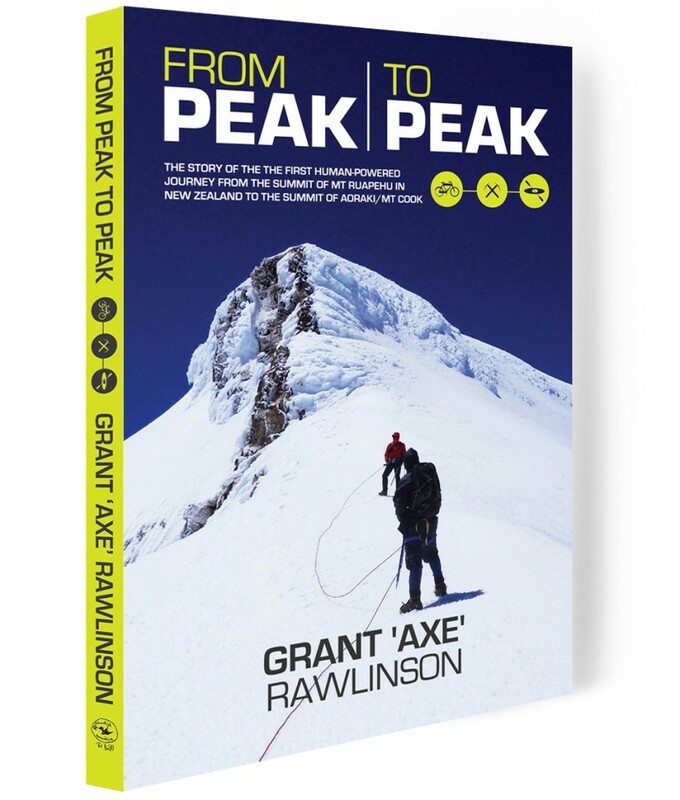 ‘From Peak to Peak’ is the inspiring and entertaining story of the two men’s journey. From the freezing winds of Mt Ruapehu, through the rapids of the Whanganui River and the huge swells of the Cook Strait, along the rolling hills of the South Island and the deadly slopes of Aoraki/Mt Cook. Follow From Peak to Peak on Facebook!